Xiaowei Zhuang couldn’t believe what she was seeing. Utilizing super-resolution microscopy techniques she had developed, Zhuang, a Harvard University biophysicist and chemical biologist, was trying to fill in missing details of how neurons connect—particularly ambitious, considering the high density and small size of neural structures, which may measure in mere tens of nanometers (one nanometer equals one billionth of a meter). Zhuang wanted to use STORM (stochastic optical reconstruction microscopy) to zoom in on the architecture of actin at the synapses, where information is passed from one neuron to the next. Actin is an important protein in a cell’s cytoskeleton, which supports its shape. So her lab tagged actin proteins with fluorescent dyes to make them glow against the black background of the nerve cells. But Zhuang and her team were distracted by a weird pattern in the actin inside the axon, the long arm of the neuron. Actin usually occurs as long or branching filaments, but here it formed rings spaced at regular intervals by a rod-shaped protein called spectrin. A unique latticework column defined the inner circumference of the axon. Zhuang and her team showed that the column may help organize sodium channels that produce the spiking electrical signals that cause neurons to “fire” signals to other neurons. They also speculated that it may give the axon needed strength and flexibility to maintain its integrity as the body moves around. In January 2013, Zhuang published this work in Science, noting another lab’s discovery that deleting the gene for spectrin in worms leads to broken axons. “It was an epiphany,” says Vann Bennett, a professor in the departments of cell biology, biochemistry and neurobiology at Duke University, who discovered spectrin in neurons. He wonders whether this might explain why motor neurons, which have very long axons, suffer most in neurodegenerative diseases such as amyotrophic lateral sclerosis. Perhaps this newly discovered skeletal support in the axon breaks down in those disorders. “It’s a question worth investigating,” he says. That’s a major benefit of super-resolution microscopy—it sends researchers in pursuit of answers to questions no one had previously known enough to ask. That has been the magic of the microscope, ever since Antonie van Leeuwenhoek produced the first magnifying device capable of revealing single cells in 1674. Then, people were astounded to see previously invisible “animalcules” (bacteria) swimming in a drop of water. Now we can observe proteins scurrying around a cell’s cytoplasm, lipids diffusing through the cell membrane, DNA spiraling in the nucleus, and much more. 1. “Breaking the Diffraction Barrier: Super-Resolution Imaging of Cells,” by Bo Huang, Hazen Babcock and Xiaowei Zhuang, Cell, Dec. 23, 2010. This review describes the challenge of beating the diffraction limit of resolution and the quantum leap forward in fluorescent microscopy in the 2000s with the development of super-resolution microscopy. 2. “Putting Super-Resolution Fluorescence Microscopy to Work,” by Jennifer Lippincott-Schwartz and Suliana Manley, Nature Methods, January 2009. 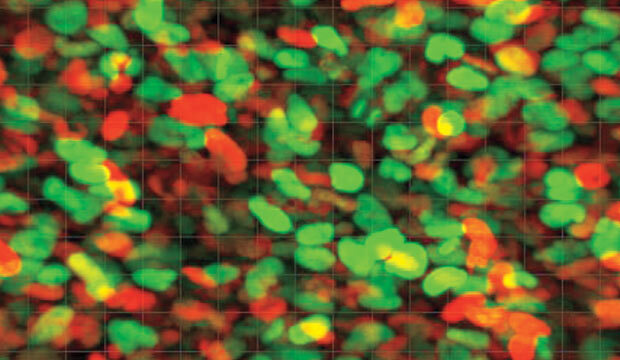 The authors discuss how super-resolution microscopy can revolutionize the understanding of the cell, but caution that researchers must still consider the technology’s limitations. 3. “Actin, Spectrin, and Associated Proteins Form a Periodic Cytoskeletal Structure in Axons,” by Ke Xu, Guisheng Zhong and Xiaowei Zhuang, Science, Jan. 25, 2013. An account of the Zhuang lab’s discovery of a surprising structure in the cytoskeleton on neural axons using the super-resolution technique STORM—opening up questions about neurobiology no one knew to ask before.